The terrace awnings ASSOL and CASCADE are outdoor sun protection systems that combine innovative design and ease of operation. Whether to identify an entry, protect or embellish a facade, choosing an awning offers many benefits and unlimited opportunities. It coordinates with the existing architecture and is offered in a wide range of styles and designs. The philosophy of the Assol system is balance and harmony with nature, which is why the style of the terrace system is considered, according to modern trends in eco-design. Clear lines make the structure light and concise. The system looks great both in the open space and in tandem with the facade. Combining a sophisticated and innovative design with ease of installation, the system is a unique product for creating a comfortable space for your home or an outdoor cafe. Outdoor shading system CASCADE. Ideal for sun protection and creating a comfortable space for commercial areas. 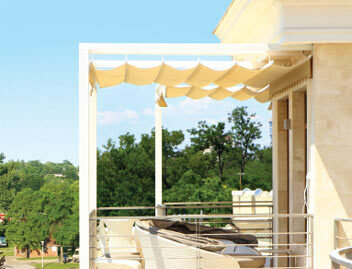 It is often used as a gazebo or canopy adjacent to the facade in a private house. Has increased wind resistance. On request, execution with additional vertical protection, up to ground level.